Join festivalgoers from across the country in the East Riding this spring for a joyous long weekend of world-class music. The young New Paths spring festival is full to bursting with 27 events in a variety of venues across the beautiful market town of Beverley. This ‘unstuffy’ festival is a major community event in the region with a buzz that is irresistible. Events run throughout each day – from morning til night – ranging from short introspective performances to dazzling evening concerts. We hope to offer something for everyone and are confident you will enjoy browsing the programme. Don’t miss one of the most dynamic new classical music festivals in the land this April. Set sail with us on a joyful journey of musical discovery: meet an array of musical instruments and watch the world-class players up close. 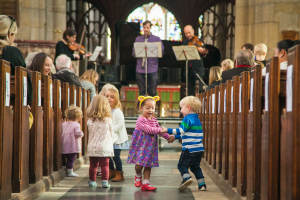 The New Paths children’s concerts have become a firm favourite in the Beverley calendar! Especially designed for pre-schoolers and their grown-ups, these concerts bring captivating and vivacious music to the youngest of audiences. Feeding, changing, singing and dancing all equally welcome! 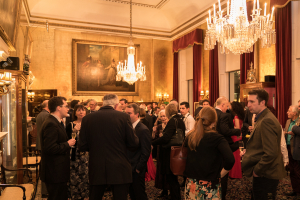 New Paths is indebted to its Friends & Patrons, without whose generous support the festival would not happen, and this convivial evening party to thank them is sure to kick-start the festival in style. Guests will meet some of the festival artists and be entertained by them over drinks. Details of this special event will be sent to Friends & Patrons directly. See the Support page for information on supporting New Paths. We open the festival with a springtime Dawn Chorus of birdsong in music. Recorder player Ian Wilson was a hit with last year’s audience, and this programme features that melodious instrument in repertoire spanning over eight hundred years: Hildegard of Bingen’s Columba Aspexit is one of the earliest known representations through word painting in music of bird music, the descent of the dove beautifully depicted, whilst Hans Martin Linde’s 1968 Music for a Bird explores an array of experimental sound effects to replicate birdsong. Renowned baritone Marcus Farnsworth brings us poetic birds in the hands of our cornerstone composer Brahms, and joins our very own male-voice chorus of local singers in Moeran’s rustic folksong settings. We conclude with Haydn’s celebrated ‘Lark’ Quartet, so-called for the soaring, circling violin melody in the first movement: the work’s elegant wit and charm provide a beautiful showcase for our exceptional string team. 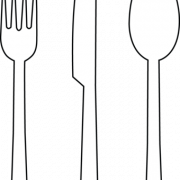 A sociable chance to meet like-minded festivalgoers whilst enjoying a light lunch in the East Riding Theatre’s popular House Café. Reserve a place and pre-order from the chef’s special menu. 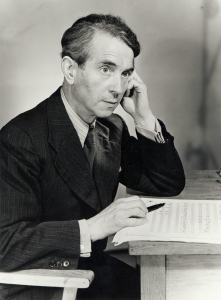 Herbert Howells (1892-1983) was a great figure of twentieth century English music, studying with Stanford at the RCM, subsequently teaching there himself for sixty years, and eventually buried at Westminster Abbey alongside Stanford and Vaughan Williams. Known particularly for his choral and organ music, this week we explore Howells’ often-neglected but searingly beautiful chamber works. 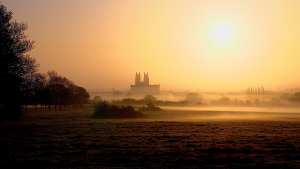 Much of Howells’ music is infused with a curiously English and deeply personal nostalgia. He was no stranger to personal tragedy, not only living through both world wars, but also poignantly losing his nine-year-old son Michael to polio in 1935. British music specialist Jonathan Clinch recently completed Howells’ unfinished Cello Concerto, and is currently writing a biography of Howells as well as editing a volume of the composer’s unpublished piano music. This is a wonderful chance to hear Jonathan introduce this enigmatic figure, as well as the works we will hear this week. This year we are profiling the work of English composer Herbert Howells, across a number of events. His Sonata for Oboe and Piano is a hauntingly beautiful work, its soaring and almost vocal lines ideally suited to the generous acoustic of the Minster. Although the piece was written during the Second World War, it was deemed too difficult, and was in fact not premiered until 1984; only now is the work earning its deserved place in the repertoire. Gurney and Howells were close friends and students together at the RCM. These piano preludes by Gurney are one hundred years old this year, a reflection on his own grim experience in the First World War. 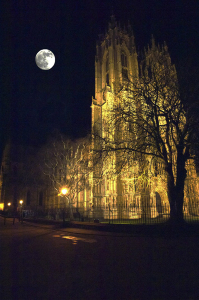 Performed beside the war memorial chapels of Beverley’s beautiful Minster, this free pop-up event forms the first of our ‘moments to reflect’ during the festival. Our Schubert Odyssey begins with Winterreise, that epic tale of lost love and despair. Our protagonist has been rejected by his beloved, and sets out on a brutally icy and lonely journey, with only the snow, the bare trees and the occasional crow to keep him company. A gradual descent into madness ensues, depicted in some of Schubert’s most devastatingly beautiful music. An established song duo of ten years’ standing, Marcus and Libby return to the Beverley stage after their memorable Dichterliebe in our very first festival. Conveniently situated on Saturday Market, the local branch of Carluccio’s is a favourite with Beverlonians. Choose from the entire chain menu, compare notes on the day’s music with other audience members, and be confident of getting to the next event on time! 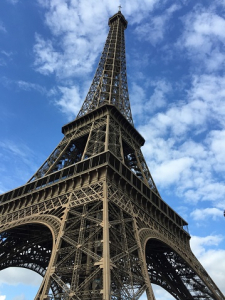 In this the 25th anniversary year of the opening of the Channel Tunnel, we explore two sets of Anglo-French teacher-student inspirations, as well as the connections between two extraordinary sisters. Vaughan Williams spent three months studying with Ravel (in fact three months his junior), looking to explore a more luminescent, less Anglo-Teutonic style of composition, and their enduring friendship enriched both their lives and their music. Tonight Ravel’s effervescent string quartet is partnered with Vaughan Williams’ little-known but wonderful piano quintet, not known to have been performed between 1918 and 1999. The latter features double bass, which we spotlight in Lennox Berkeley’s Introduction & Allegro, performed by the esteemed bassist John Tattersdill, who was for 42 years principal double bass at the CBSO. Berkeley too turned to France for fresh musical inspiration, studying with Nadia Boulanger in Paris, and so we hear her poetic Trois Pièces for cello alongside songs of sensuous beauty by her sister Lili. 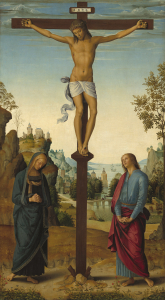 For the first time this year New Paths falls in the season of Lent, which we mark with this performance of Pergolesi’s Stabat Mater – portraying the suffering of Jesus’ mother during his crucifixion. Pergolesi’s fame during his lifetime was in no small part brought about by his operatic writing, and this sense of drama and character is developed here in his sacred writing. 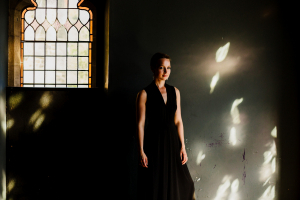 Helen Charlston won First Prize in the 2018 Handel Singing Competition whilst Rowan Pierce won First Prize at the inaugural Grange Festival International Singing Competition; both are currently Rising Stars of the Orchestra of the Age of Enlightenment, and tonight they join our festival string players for a performance of this intensely expressive and much-loved baroque work, in the intimate reflective surroundings of St John of Beverley Roman Catholic Church. This venue has limited space – be sure to book in good time. The ‘driving force of all nature’ (da Vinci), water, has inspired composers through the ages. 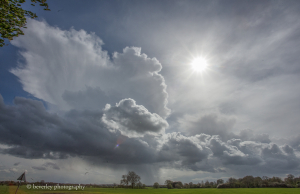 Over the years we are surveying the works of Brahms; the first of his sonatas for violin and piano is known as the ‘Rain Sonata’ for its quotation of his own song Regenlied. Full of radiant spring freshness, its gloriously lyrical melodies and rhythmic energy contrast with the more contemplative final movement – recalling the long-lost days of youth, as triggered by the patter of rain on the window. 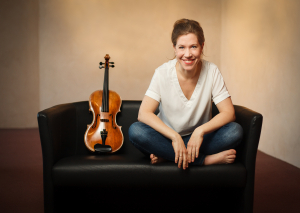 Our 2018 audience took violinist Eva Thorarinsdottir to their hearts; we are delighted to welcome her back as she joins Martin Roscoe for this celebrated work. 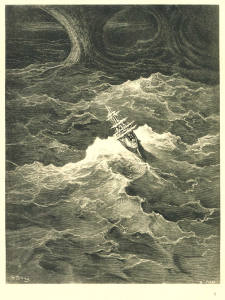 Rime of the Ancient Mariner tells of the misfortunes of a seaman who shoots an albatross, spelling disaster for his ship and fellow sailors. Howard Skempton’s extraordinarily atmospheric setting (2015) for baritone and chamber ensemble of Samuel Taylor Coleridge’s iconic poem is described by the Times as ‘deceptively simple… hypnotically effective… marvellously evocative.’ We are thrilled to welcome Marcus Farnsworth to perform this exceptional contemporary work. Franz Schubert (1797-1828) is widely considered to be the father of Lieder: he wrote over 600 songs, deploying his stunning gift for melody, and using the piano accompaniment to vivid pictorial effect unlike any of his predecessors. He was also the first to write large-scale narrative song cycles, of which we hear all three over the course of the festival. Each explores themes of love and loss, from the burned optimism of Die schöne Müllerin’s young lad, to the embittered Winterreise protagonist or the terrifying drama of Schwanengesang’s posthumously-published songs. 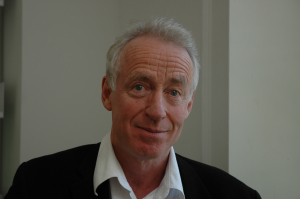 Richard Stokes is a world authority on Lieder. 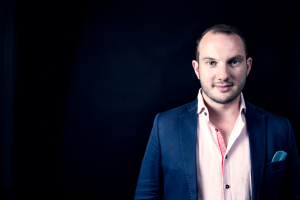 Professor of Lieder at the Royal Academy of Music, a regular juror at international Song Competitions, and with numerous books of song translations to his name, this is a wonderful opportunity to be introduced to this most exquisite of musical repertoires. 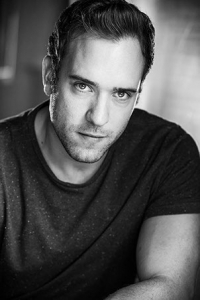 The second stop in our Schubert Odyssey sees exceptional tenor Nicholas Mulroy, hailed for his impassioned storytelling as Evangelist in Bach’s St John Passion at the 2017 BBC Proms, join Libby Burgess in Die schöne Müllerin. Perhaps the best-known of Schubert’s song cycles, it tells the tale of a young lad stepping out into the world full of optimism, only to meet with bitter disappointment when the beautiful miller’s daughter fails even to notice him. Heartbroken, he is ultimately driven to despair, and Schubert mirrors every step of his gradual mental descent in some of his finest music. Our Friday night supper is at the stylish Filmore & Union restaurant in the heart of Saturday Market. Relax among the candles, fresh herb pots and fur rugs and enjoy some fresh and wholesome food before the evening’s concerts. Reserve a place and pay the restaurant directly on the night. The first ever New Paths festival concert included Beethoven’s An die ferne Geliebe (‘To the distant beloved’), and tonight we welcome one of the UK’s most prolific pianists, Martin Roscoe, to perform Schumann’s Fantasy, which quotes that same work, from a time when Schumann was forced apart from his own future wife Clara. Inspired by the wayfarer’s lamp in the priest’s room, used to guide travellers across the Westwood, we programme John Ireland’s 5 Songs of a Wayfarer, performed by Benedict Nelson. New Paths has commissioned new music for every one of its festivals, and our premiere tonight for oboe and piano also takes its inspiration from the town of Beverley: Stephen McNeff imagines that the Pilgrim Rabbit of St Mary’s has the magical properties to transform from cold medieval stone to warm fur and whisker, going exploring at night to take advantage of the rich pickings available on the Westwood. Mary Stuart became Queen of Scotland at the age of six days, was sent to France aged five, widowed at eighteen, imprisoned for almost twenty years, and eventually beheaded by Elizabeth I. Schumann sets five short poems, attributed to Mary herself, pleading and praying at different stages of this extraordinary life; her sense of doom perhaps mirrored his own at this late stage of his life. 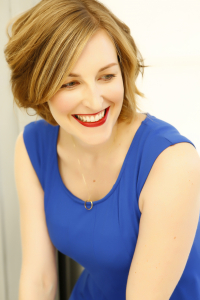 Noted mezzo-soprano Katie Bray sings these and Richard Rodney Bennett’s frothy History of the Thé Dansant, a vivid depiction of 1920s holidays in the South of France based on postcards discovered in the composer’s parents’ attic. 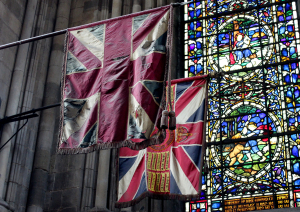 The south window of the south transept of Beverley Minster contains stained glass symbolising ‘the Age-Long Conflict between Good and Evil’; this aptly describes the philosophical subject matter of Messiaen’s profoundly spiritual Quartet for the End of Time. Written while he was a prisoner of war in German captivity, the piece was premiered outdoors by Messiaen and his fellow prisoners using the instruments they could lay their hands on, in freezing temperatures, to a rapt audience of hundreds of inmates. ‘Never was I listened to with such rapt attention and comprehension,’ the composer later wrote. The music combines the exotic dance rhythms and birdsong which permeate so much of his music with astonishing depictions of radiant eternity, inspired by the Biblical book of Revelation: pianist Steven Osborne concludes that the work offers a stark juxtaposition between the destructive and creative potentials of humanity, a struggle we all embody to some degree’. Whilst the Quire of the Minster contains the largest number of misericord seats of any church in the country, the total capacity of this extraordinary space is limited so early booking is advised. Whilst Beverley’s famous Saturday Market bustles outside, step into beautiful St Mary’s and bask in the luminous soundworld of quintessentially English music. In 1883 the Royal College of Music was set up by royal charter on South Kensington’s Prince Consort Road. Amongst its founder professors was Sir Charles Villiers Stanford, who held a post there for the rest of his life and nurtured the talents of the greatest composers of the age. Today’s programme is a snapshot of a special period of thirty years, during which an extraordinary cohort of composers passed through his class. We continue our spotlight on Howells with his Fantasy String Quartet, a free-spirited and romantic work, and his close friend Gurney features in a set of ravishing English song. Arthur Bliss’ serene Pastoral features the clarinet, whilst Gordon Jacob’s rarely heard Hearken Unto Me is scored for the unusual combination of soprano, viola and organ. Concluding the programme is Rebecca Clarke’s monumental romantic viola sonata, first performed one hundred years ago in 1919; Clarke herself was an outstanding violist and became one of the country’s first female professional orchestral musicians when she was selected by Sir Henry Wood to play in the Queen’s Hall Orchestra. New Paths is thrilled to present John Rutter’s charming musical setting of one of the most loved children’s stories of all time, Kenneth Grahame’s The Wind in the Willows. Join Ratty, Mole, Badger, and the irrepressible Toad – plus the dastardly Ferrets and Weasels – in an adventure of river and woodland, featuring a cast of singers from the West End and the country’s great opera stages. The perfect way to start the school holidays. Snap up your tickets now: this is sure to be a sell-out. 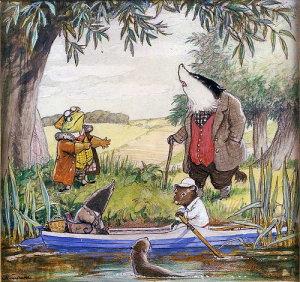 Arrive from 1:15pm for Wind in the Willows crafts in the East Riding Theatre House Café. In today’s Schubert slot we take a break from song, and replace it with chamber music based on song – Schubert’s uncompromisingly sunny piano quintet inspired by his own much-loved song Die Forelle, or The Trout. Scored not for a conventional piano quintet lineup but rather for violin, viola, cello, double bass and piano, the work – written in 1819 – celebrates its 200th birthday this year. In his study of Schubert, Alfred Einstein declared that the ‘Trout’ Quintet is music ‘we cannot help but love’: Schubert’s gift for melody and the charming interaction between the instruments are sure to be a joy in the hands of our dynamic musicians. Classical music has always been central to the silver screen, enhancing the moments of dramatic tension and poignant beauty indispensably. This gala concert presents works that feature in films ranging from Shine and The Mission, to Truly, Madly, Deeply and Shawshank Redemption, via Henry V and West Side Story. Popular classics by Handel, Mozart and Bach meet Barber’s Adagio, Pärt’s Spiegel im Spiegel and Puccini’s O mio babbino caro in what’s bound to be an unforgettable evening for film-lovers and music-lovers alike. 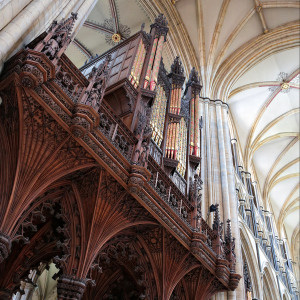 The opening of Beverley Minster’s Snetzler organ in 1769 was celebrated with a huge Handel festival. In honour of the 250th birthday of this fine instrument, today’s recital begins in celebratory style with Guilmant’s grand March on a Theme of Handel, and Handel’s own joyful Organ Concerto in F Op 4 No 4. The Sunday organ recital has become a cornerstone of the New Paths programme. Ashley Grote, Master of the Music at Norwich Cathedral, makes a very welcome return to Beverley: he delighted hundreds of singers with his warmth and brilliant musicianship in the first ever New Paths event in 2016, the Alan Spedding memorial Come & Sing in the Minster. Formerly of King’s College Cambridge and Westminster Abbey, Ashley possesses an illustrious pedigree as an organist. 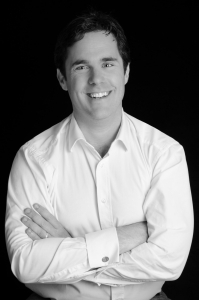 His beautifully crafted recital programme includes Rhapsody No 1 by featured composer Herbert Howells and John Ireland’s rollicking Capriccio. Standing between these pieces is the great Prelude and Fugue in G BWV 541, one of Bach’s most beloved organ works. To end the recital we blast off on a journey into outer space in three movements from Holst’s ever-popular The Planets, sure to send festivalgoers out with a smile. Touch down to the Monk’s Walk afterwards for a Sunday roast. Join us for a traditional Sunday Roast at the cosy Monk’s Walk, one of the oldest pubs in Beverley – and, legend tells, the birthplace of sixteenth-century theologian and musician John Merbecke! The second of our moments of reflection takes place in the stillness of St Mary’s Church. The final work in our Howells feature this year, his poetic Rhapsodic Quintet for clarinet and strings, was written 100 years ago this year, and has been described by the great clarinettist Thea King as ‘one of the loveliest moments in music’, containing ‘the peace of ages’. Puccini’s string writing is best known in his sweeping operatic scores, but this single-movement string quartet Crisantemi (‘Chrysanthemums’) is a more intimate response to death. Meanwhile Handel’s radiant Eternal Source of Light Divine – to which Meghan Markle famously walked up the aisle last year – provides a serene and optimistic completion to a beautiful moment of contemplation. Our Schubert Odyssey concludes with Schwanengesang, Schubert’s own swan song, published shortly after his death. Whilst perhaps not intended as a cycle by the composer, the thirteen songs were released as such by his publisher, and are united by themes of love and separation, nature and loss. Described by his publisher Haslinger as ‘the final blooms of Schubert’s creative muse’, the set contains some of Schubert’s finest songs – from the familiar serenade Ständchen, to the dramatic Der Atlas and the darkly haunting Der Doppelgänger. 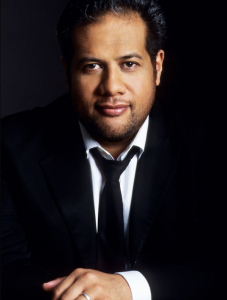 Grammy award winning bass Jonathan Lemalu is in great demand on the global stage and here he joins Artistic Director Libby Burgess. Our final supper of the festival takes us to Lucia’s, where Italian, Mediterranean and tapas food combine, and the cocktails are legendary! Clara Schumann, born Clara Wieck, was one of the most distinguished pianists and composers of the Romantic era. In this her 200th anniversary year we weave a tapestry of song and piano music by the composers with whom she surrounded herself, featuring outstanding song singers Aoife Miskelly and Katie Bray, as well as some of Clara Schumann’s own beautiful piano works, played by renowned pianist Martin Roscoe. We hear extracts from Robert Schumann’s wedding present to her, the song cycle Myrthen, as well as songs by Brahms, her closest friend and confidante. The composers whose music she regularly performed included Liszt and Chopin, and we set these alongside Schubert – reuniting Martin Roscoe and Libby Burgess after their Beverley Chamber Music Festival duet concert, for a performance of Schubert’s A major Rondo. Both Fanny and Felix Mendelssohn also feature, the latter’s fiery and lyrical Piano Trio in D minor bringing the festival to a close in a blaze of virtuosic energy.